Hanoi (VNA) – Vietnam always attaches importance and gives top priority to consolidating and developing the good neighbourliness, traditional friendship, and comprehensive, sustainable, long-term cooperation with Cambodia, Party General Secretary Nguyen Phu Trong has said. The Party leader hosted a reception for Nay Pena, Chairman of the Cambodian People’s Party (CPP) Central Committee’s Inspection Commission and First Vice President of the Cambodian Senate, in Hanoi on August 10. Trong said Nay Pena’s visit to Vietnam is of significance as it takes place in the context that the two countries are celebrating the 50th anniversary of the bilateral diplomatic ties. He noted with pleasure the enhanced relations between the two Parties and nations across fields, significantly contributing to political stability, and socio-economic development in each country. Applauding outcomes of the talks between the two Party Inspection Commissions, General Secretary Trong suggested them intensify the sharing of information and experience in the inspection and supervision work. For his part, Nay Pena thanked Vietnam for its valuable support to Cambodia during the struggle for national liberation, helping Cambodian people escape from the Pol Pot genocidal regime, as well as the during the cause of national reconciliation, construction and defence. Cambodia will work together with Vietnam to take the long-standing friendship and comprehensive cooperation to a new high, he said. 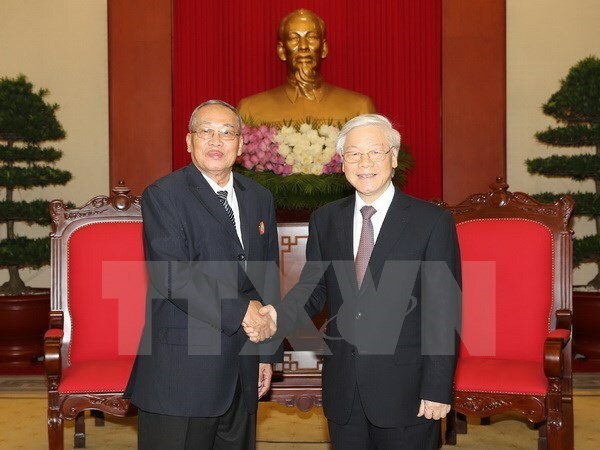 Earlier, Nay Pena held talks with Tran Quoc Vuong, Politburo member and head of the Communist Party of Vietnam Central Committee (CPVCC)’s Inspection Commission. The two sides briefed each other on the situation of their respective Parties and countries, and discussed orientations for cooperation between the two commissions.